Corrupted Gardens Update! Out now on iOS and Android! Home News Corrupted Gardens Update! Out now on iOS and Android! The Corrupted Gardens of Rath Parras are now open! Enter the realm of the gods! Once a land of peace and beauty, the Gardens of Rath Parras have become a corrupted land of never ending war. Skeletal creatures fight amongst themselves, thrashing steel against bone and channeling torrents of eldritch magic against the ancient armour of their sworn foes. Rath Parras may have once been a perfect prison for a Dark God, but time erodes all things. Crom’s eldritch influence now seeps through the failing wards and out into the worlds beyond. The Corrupted Gardens have been exposed to a level of corruption second only to the inner halls of Rath Parras itself. This corruption has twisted the once docile enchanted plantlife of the gardens into a parody of the divine powers that once gave it form. Bloodthorn the Ravenous sits festering amidst the other corrupted plants, growing more powerful as its roots drink deep from the well of corruption beneath these lands. Bloodthorn is immensely powerful, and will require a well equipped raid of 40+ heroes to defeat. Can you sever the connection between this monster and its well of eldritch power, or will you succumb to the vile toxins that surge through the ravenous maw of Bloodthorn? The corruption in the gardens has tainted more than the plant-life. Ancient forces clash in an eternal struggle outside the walls of Rath Parras, each desperate to eradicate the other. No matter how many Reavers fall, or how many Liches are banished, more always rise to take their place. Heroes who enter the gardens and follow the questline will eventually be presented with a choice over which faction to aid. The well marshaled forces of the Reavers struggle against the arcane prowess of the Liches, and only a great hero can turn the tide. Players who side with the Liches will eventually find themselves pit against the high warlord of the Reaver forces, Auraxis. This monstrous champion seeks to complete a blood ritual to eternally bind the Liches within their phylacteries, using would-be heroes as fuel! A boss designed for 8 Lich-aligned heroes to tackle once per week, Auraxis should provide a significant challenge to those who wish to face him, and significant treasures to those who manage to emerge victorious..
Players who side with the Reavers will eventually find themselves facing down the eldritch might of Archlich Thanasis. This imposing spellcaster seeks to complete an arcane ritual that will shatter the bones of every single Reaver in the gardens, literally scattering their dust to the winds. Only a well trained squad of heroes can intervene and prevent this ritual from reaching its end. A boss designed for 8 Reaver-aligned heroes to tackle once per week, Thanasis should provide a significant challenge to those who wish to face her, and significant treasures to those who manage to emerge victorious. •	Character must be over level 180. •	Navigate to the Otherworld (Fortress Outskirts Leystone) and then to the Gates of the Corrupted Gardens across the bridge. •	Interact With Farrach Baiteal and take and complete the ‘Sealing the Breach’ quest. •	Return to Farrach Baiteal and take the ‘Through the Gates’ quest. 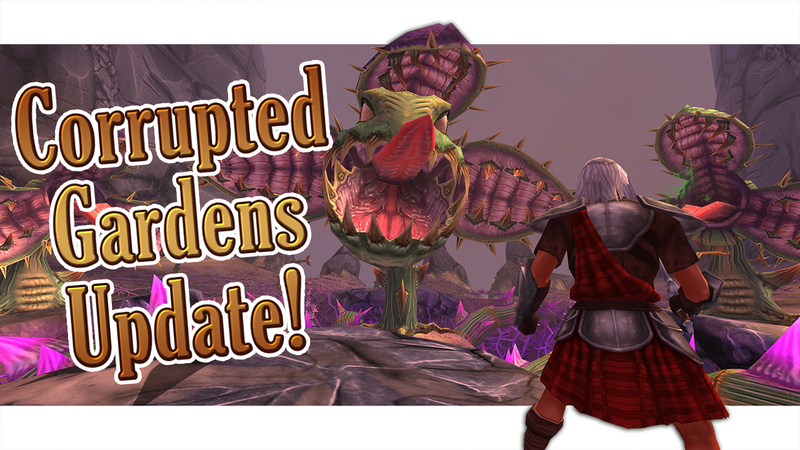 •	Navigate into the Corrupted gardens and then head to the Warden’s Encampment leystone (’?’ icon should be present). Interact with Warden Aisling to complete the quest. •	Interact again with Warden Aisling and take the ‘Prickly Plants’ quest. Complete this quest by handing into Warden Ciaran. •	Interact once again with Warden Ciaran and take the ‘Creeping Vines’ quest. Complete and hand in this quest to Warden Ciaran. •	Navigate to and interact with Warden Arlen to take and complete the ‘Fighting Corruption’ quest. The interact again and take the ‘Across the Dunes’ quest and complete, hand in to Warden Arlen. For those who have proven their allegiance in battle exclusive faction bardings are available from the top tier faction shop. For those who have proven their might, exclusive faction charms can be found in faction treasure troves. Mirain the Seer has projected her being to the land of the gods to assist you in purging the corruption from these treacherous lands. Heroes of level 220 and above should visit her at the Warden Encampment to accept her quest. EDL Offhand pre requisite. Once obtained, the offhand can be upgraded by defeating one of the faction bosses each week, and obtaining the ‘Echo of the First Wardens’ item. A flight of corrupted drakes have infested the lands of Dal Riata, seeking to imbalance the natural order of new life during Ostara. Speak to Marsail Ivyshroud in the Guild Alley at Farcrag Castle for details on this quest. A new chest exclusive exotic fashion acquired from far-off lands. New exclusive Demonheart Battle Mount barding! New Facebook Login System. Link your account to Facebook for easy login! No more forgotten details! New UI change allows you to favorite selected recipes. From player feedback, we have made some re-balancing to the Frozen and Dragonlord bosses! – NO CHANGES have been made to any of the quests or the number of items required for any armour quests. – Spawn chance of 4* placeholders lowered and spawn chance of 5 and 6*s increased. – All spawn points have a 3 minute window. – Spawn times on all spawn points have been lowered to allow for, on average, a higher number of 6* spawns per day. – All spawn points have a 3 minutes window. – Drop chance of items from 4* mobs have been greatly increased. ‹ Winter Update! Out now on iOS and Android!